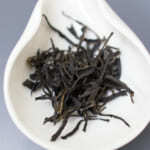 Using the wild tea from Da Xue Shan, we have produced wild raw pu-erh tea and wild white tea. Since the beginning of 2018, there was extremely less rainfall. As a result, the quality of tea became excellent as tea was growing very slowly. It is reflected in the sweetness on palate and the long lasting after taste. We also succeeded to improve the flavor this year thanks to the improvement in the process. 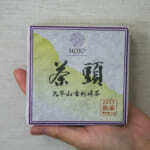 In previous years, we released Da Xue Shan Wild Tea loose tea (mao-cha) on pre-booking and processed the balance into cake. This year, we will only release limited quantity of loose tea. We have already processed the balance quantity into tea cake now. This is to speed up the entire process and to keep the freshness of tea. Since we only have the loose tea in limited quantity, we will close the pre-booking as soon as the reserved quantity of mao-cha is sold. We are planning to ship out the tea in May. The appearance of the wild tea is like wild herbs. We have selected the wild tea called Camelia taliensis. One important note is Camelia taliensis is not equal to the wild tea. 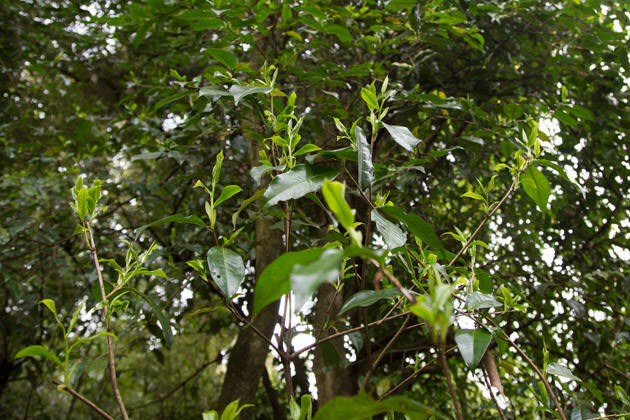 Wild tea means the tea trees are found naturally growing in the mountain. 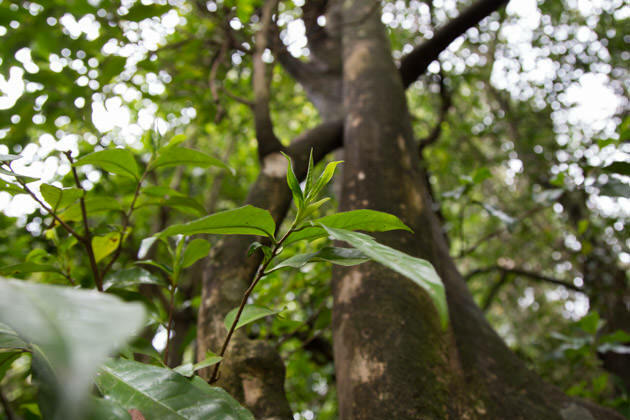 However, many trees of Camelia taliensis were planted around the village, especially with the recent increasing demand of “wild tea’, many tea farmers started to plant or grafted the Camelia taliensis in their tea gardens. 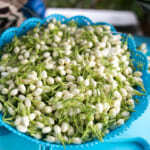 Long ago, the ethnic minority tribes live near the foot of mountain has been drinking tea made from Camelia taliensis. 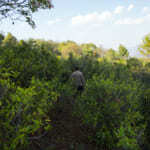 They have also planted a number of Camelia taliensis on the foot of the mountain located near their village. Although some of those trees are old, there are many cattle walking up and down every day. 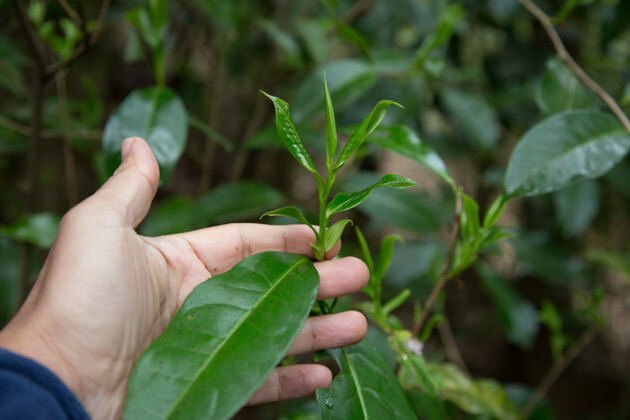 As a result, these trees of Camelia taliensis are naturally fertilized and the taste is lighter compared to the authentic wild tea found in the mountain. In Yunnan, people always call Camelia taliensis as wild tea, even though the tea tree is grown by people. So, it is very important to distinguish between the real wild tea and human grown Camelia taliensis. It’s common that so-called wild tea in the market is made from the human grown Camelia taliensis. 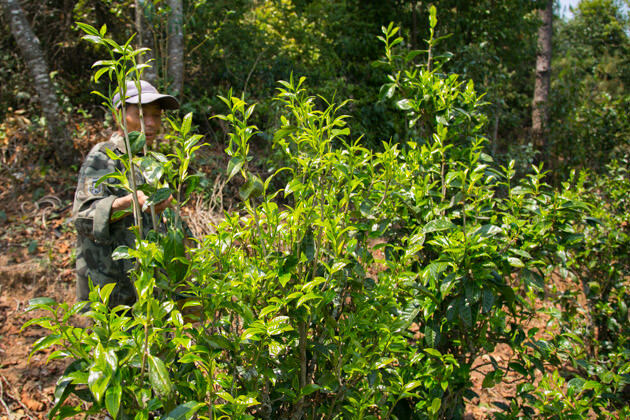 The authentic wild tea generally consists of huge tea trees. It gives very long-lasting taste, clear and transparent taste, with natural sweetness lingers on palate and its taste lasts for many brewing. The above photo is the Camelia taliensis planted in a tea garden. The photo below is the Camelia taliensis planted on the foot of mountain near the village. You can tell how huge the size of tea trees is if you compare to me who is standing on the left down. The real wild Camelia taliensis could grow even bigger. 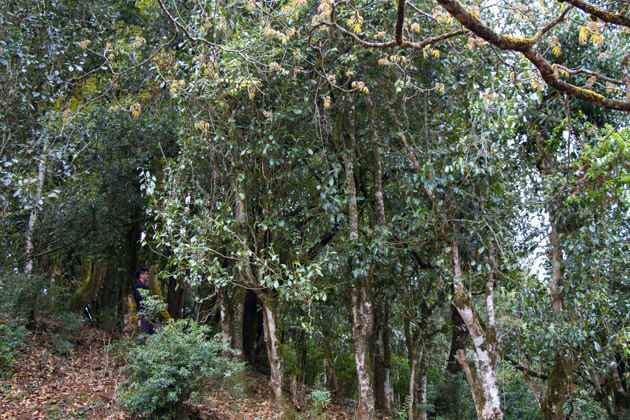 Trees of Camelia taliensis planted around a village located near the foot of mountain. As there are so many human-planted “wild tea”, it is important for us to make an effort in order to ensure we obtain the real wild tea. 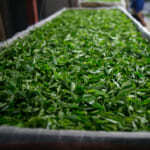 The fresh tea leaves of wild tea were collected by the villagers live at the foot of mountain. In the deep mountain, each small village is normally formed by one ethnic minority tribe and they are lead by the chief of the village. Due to the extreme remote location and lack of infrastructure, the living style is more isolated and they are not used to interact with outsiders. Most of them couldn’t comprehend Mandarin and they only speak their own ethnic minority’s language. Normally they will follow the instruction of the chief. 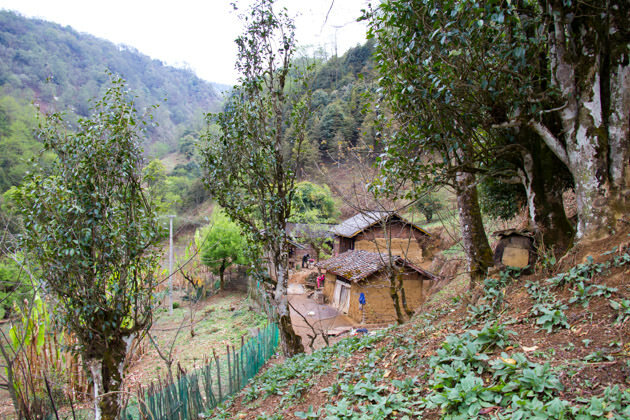 Usually, the chief of the village will gather the villagers to go for tea plucking in the mountain. We have been meeting the chief a few times in each season. Since the demand of wild tea is increasing and it is becoming more competitive, it is not just a business matter that works but it is important to build a good personal relationship. A few years ago, he was less interactive with us. However, after we have been meeting him over and over again, nowadays we become quite close. 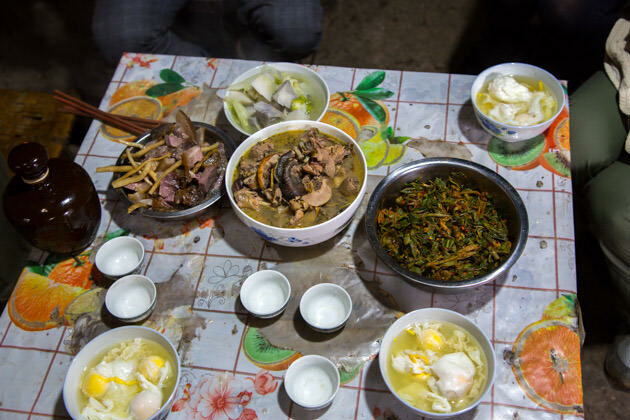 When we are visiting his village, his family cooked dinner for us. 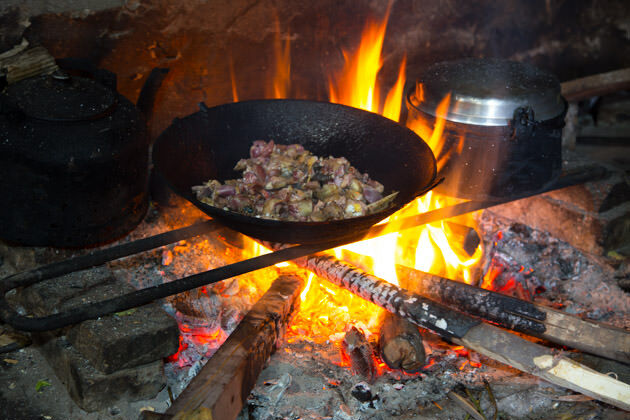 They use their own chicken, vegetable and a lot of wild herbs for cooking. Thanks to the outstanding quality of those materials, it is not only the taste bud but also my body tissue that really can respond. After the dinner, it is always inevitable that we drink their home brewed and distillate alcohol. I cannot deny that sometimes alcohol helps a lot to make our relationship smoother. 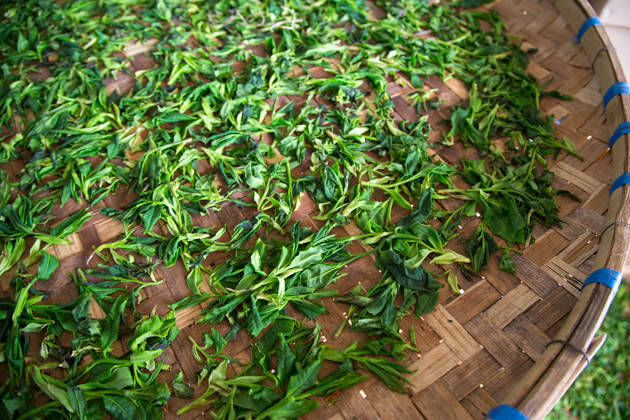 We collect the authentic wild tea from the mountain. This wild tea is excellent in taste. But it tends to gives milder flavour. It is because the genuine wild tea is grown under the shaded area in the forest. Due to lack of sunshine, the flavour tends to be lighter. On the other hand, human-planted “wild tea” tends to give strong flavour as those trees are directly exposed to much sunshine. 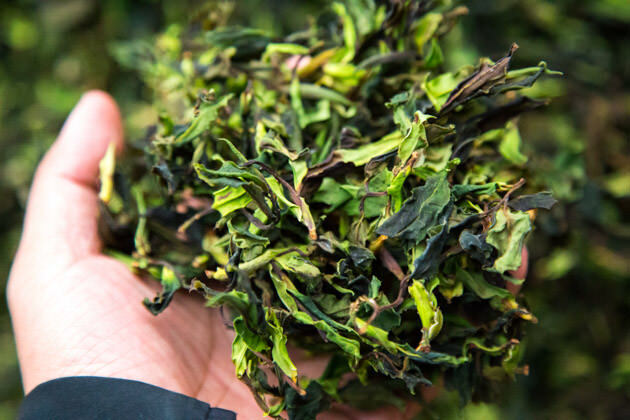 In exchange to its stronger flavour, the taste of human-planted wild tea is lighter and not as clear as the genuine wild tea from the mountain. As we are aware of the facts mentioned above, we decided to conduct longer withering process. 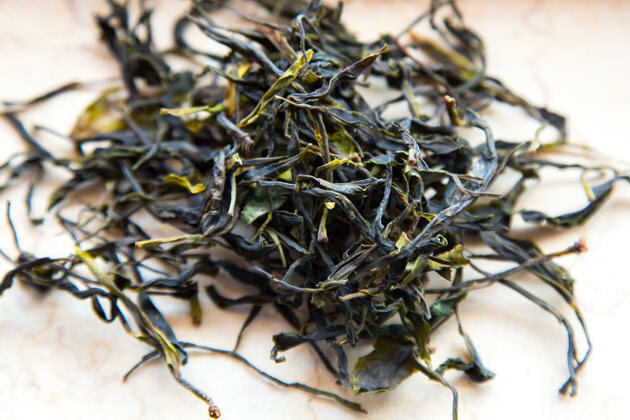 For both wild pu-erh tea and wild white tea, we conducted withering overnight. Then we proceeded pu-erh tea for pan-frying and white tea for the further indoor withering. Thanks to this improvement, we managed to produce tea that we can enjoy both flavour and taste. 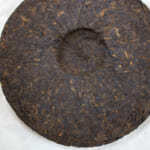 I am delighted with the outcome of Da Xue Shan Wild Pu-erh Tea we produced this year. We could manage both material and process in an ideal manner. 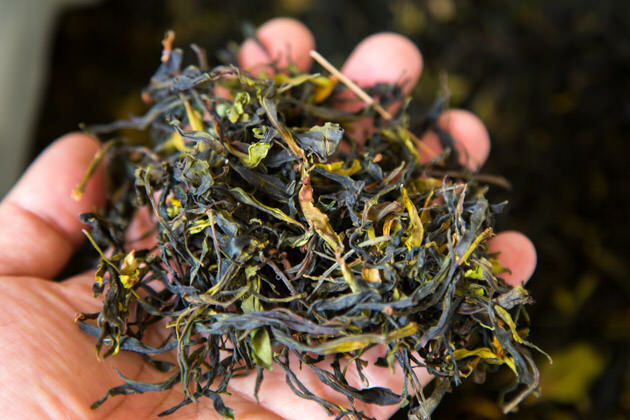 Last year we have learned from the process of Huo Cao Shan raw pu-erh tea that the longer withering makes the flavour of tea becomes more floral and sweet. So, we applied the same technique on Da Xue Shan wild raw pu-erh tea. We decided not to process the tea on the same day it was plucked. 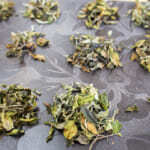 Instead, we let the fresh tealeaf withered overnight and pan-frying was conducted the next day. Thanks to the longer withering, tea has light enzymatic oxidation and developed sweet flavour. It gives very soft and long-lasting aftertaste. The flavour of this tea is not over showing off. It is rather gentle. With every sipping, the refreshing sweet floral scent is emerging slowly in my mouth. I enjoy its flavour which gently unfold on my palate and not rushing out swiftly. This is the type of tea I love to drink daily. 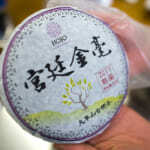 The flavour of Da Xue Shan Wild Raw Pu-erh Tea is like spring flowers, with trace hint of grapes and green apples flavour. If you love the refreshing floral flavour, mao-cha is a good choice. 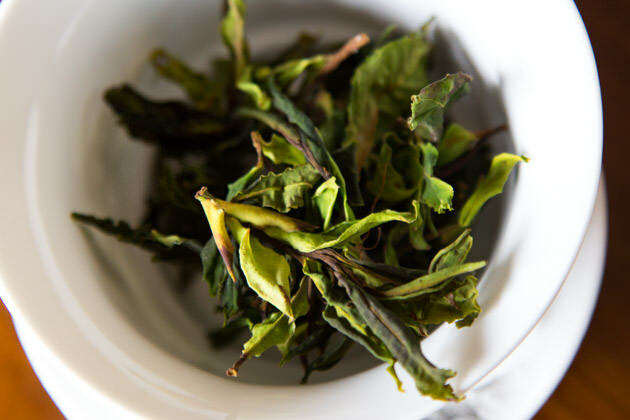 Based on our experience, the mao-cha of Da Xue Shan is ideal for aging too. If you wish to age this tea, please keep the bag unopen and store in a room that average temperature of a year is highest in your house. We only have the limited quantity of mao-cha as the balance was already compressed into cake. Please place an order as soon as possible if you are interested. Please send us an e-mail or Facebook message if you are interested to book this tea. For customers residing in Malaysia, please visit the following website. We have developed the production process of Wild White tea together with our manufacturer since two years ago. Nowadays black tea and pu-erh tea produced from wild tea is quite common. But the white tea produced from wild tea is very rare and uncommon. This year we conduct withering of wild white tea on the bamboo plate placed on racks. As we improve the air ventilation, we managed to keep the colour of tea greener than last year with more appealing flavour. It gives refreshing floral scent with a hint of grapes or like fresh spring herbs from forest. 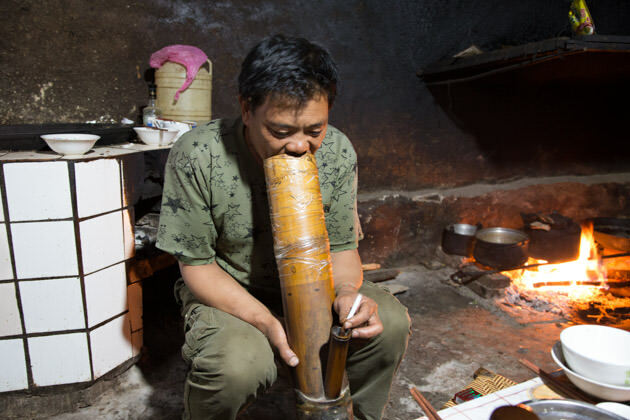 It also gives very long-lasting aftertaste; I could feel the taste is thick and lingers down my throat. As it is made from the wild tea collected from deep mountain, it gives a clear and transparent taste and flavour. I also enjoy the sweetness lingers on palate. This tea is also suitable for aging. It develops fruity and sweet flavour like raw honey after aging. 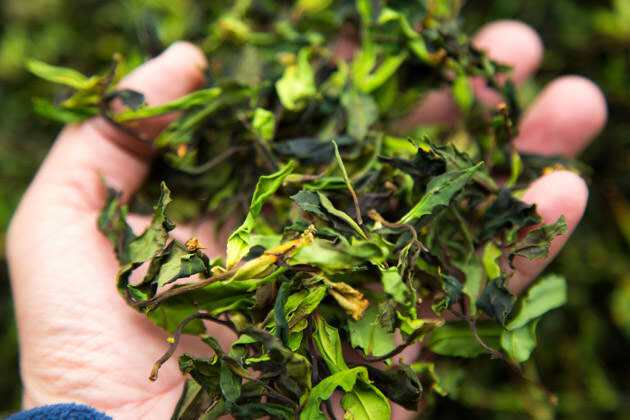 The process of Da Xue Shan Wild White Tea doesn’t involve pan-frying to inactivate enzyme. The enzyme activity is stopped as tea is dried to low moisture content. 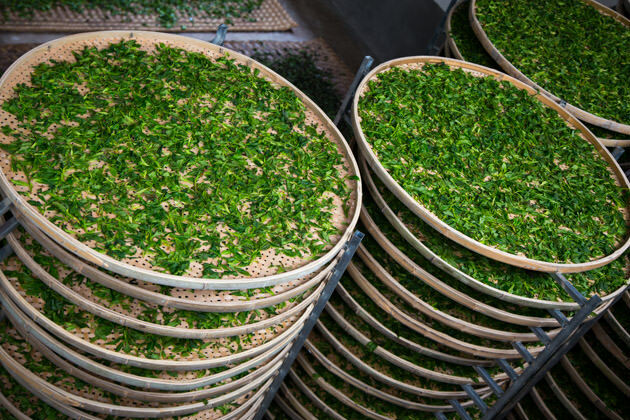 During the compression of white tea, tea is steamed to soften the leaf. After compression, it takes some time for drying. As tea is moisten during compression, the enzyme in white tea gets slightly activated. 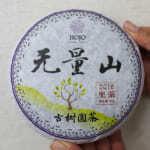 As a result, the flavour of Da Xue Shan White Tea cake is fruitier as compared to loose tea which has more distinctive floral scent. So, in terms of flavour, the loose tea and cake are not exactly the same. As we only have limited quantity of loose tea, please place an order as soon as you can. Once the quantity of loose tea is sold, we will close the booking of loose tea.